Want a more intimate hostel to meet other fellow travelers? So Suite Hostel is just for you! Suite Hostel is in the perfect location and the perfect place to meet fellow like-minded travelers and share travel experiences with. We welcome all travelers to come join our community, to spend some time, hang out and party with the family. Free Wifi In every room! Suite hostel is a medium sized hostel, with a chilled vibe. There's no noise curfew or any of that nonsense, especially cos we like to have a good old singalong on our balcony every now and then. We just want to make sure every one gets a long, enjoys their stay, check out the city, chill if they want to or party their hearts out if they want to. 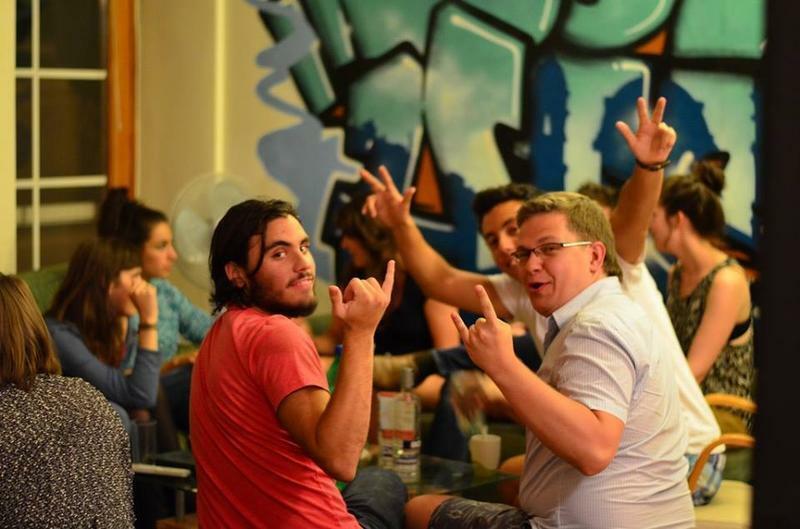 The staff at Suite Hostel are all young local and international people who are outgoing, fun, ready to show you a good time in 'Pest, yet still have a professional manner. We are very knowledgeable about our city and all its hot spots and are more than willing to sit down and show them to you on a map. Often will take you around ourselves, because we love this city and want you to enjoy it just as much as we do! We want to make sure you are more than just another number and become part of our little family. We have an extensive social program and we are located in the heart of Budapest, near all the attractions such as the Castle district, St. Stephen's Basilica, Thermal bath houses and the Citadel. At the same time our area has the most bars and clubs to which the staff will gladly take you. For those who like to prepare their own meals, the central market hall is at the end of our street, two minutes walk away; but if you like eating out, ask the staff for the best places to go, there are plenty in the area. We have three fully equipped kitchens so there is never any waiting time to make your meals. Also, we encourage dinner nights so we can all enjoy each others company. We accept Euros and Hungarian Forints, but no Credit Cards. Cancellation accepted only 24 hours before the presumed arrival-day. Check in is at 2pm and checkout is by 11am and can be negotiated with staff. People often choose hostels that are near the train station because it is easier to walk to the hostel rather than try to manage with a foreign metro system. We understand this, all of the staff were travelers at one point too, but, believe us, none of the train stations are pleasant areas to be around. Suite Hostel is worth getting to, its not far from the train station, in fact it is at the epicenter of action in the city, and we have made extra effort to provide clear and concise directions for your travelling ease. There are not a lot of signs indicating the hostel because it is located in a private residence; as well, there is another hostel in the same building as us so keep an eye open and make sure you are in the right place. Tickets for the metro need to be purchased ALWAYS, dont try and ride for free because ticket controllers are very unpleasant people. One ticket is valid for one ride on in one direction for a half hour. Every time you change forms of transportations, ex. from bus to a train, you need to validate a new ticket. You can purchase the tickets either from the ticket booth in the metro or at an automated ticket machine. On the buses and at the metro stations there are red and orange boxes where you validate the tickets. Walk out of the front entrance and turn right. About 50 metres in front of you there will be a set of stairs that lead to the metro station. Take the metro three stops in the direction of Kobanya Kispest to the stop Ferenciek Tere. You will need to take 1 bus and 1 metro. There will be a stop for bus #200 outside the terminal. Take it to the last stop called Kobanya Kispest, this is where almost everyone will get off, so follow the masses. From there you can take the metro 9 stops to 'Ferenciek tere.' Once there, follow the directions at the bullet point above. There will be many signs with a big M indicating where to go to catch the red metro. Follow them and take the metro to Deak Ter. At the red metro you will need to change from the red line to the blue line. Catch the blue metro going in the direction of 'Kobanya Kispest' and get off after one stop at Ferenciek Tere. Once there follow the directions at the bullet point above.